If you love peach, you know who you are and this is the flavor for you. Fruity and sweet yet satisfying. Another new and popular flavor. South Beach Smoke’s easy to use vaporizer with cartridges contain two components that are essential to the operation of any vape. The atomizer is an electrical coil that is heated up by the battery every time the microprocessor senses an inhalation or, in some batteries, when a fire button is pushed. This coil is fueled by “e-juice” (sometimes called “e-liquid” or “vape liquid”) preloaded into each cartridge. This liquid consists of food grade propylene glycol and/or vegetable glycerin, aromatic flavorings and an optional nicotine isolate. The cartridge screws securely onto the battery. This two-piece design eliminates leaking and gives vapers a smoother, cleaner draw than other e-cigs on the market. To use, simply charge the battery, attach the cartridge, close your lips over the mouthpiece and inhale. The battery will fire, heating the coil in the cartridge. The self-feeding cartridge delivers a small amount of vape juice to the coil, which heats up and and converts the liquid to a non-toxic aerosol. This gas enters your lungs, delivers a carefully measured dose of nicotine and exhales as a satisfying vapor that resembles cigarette smoke. 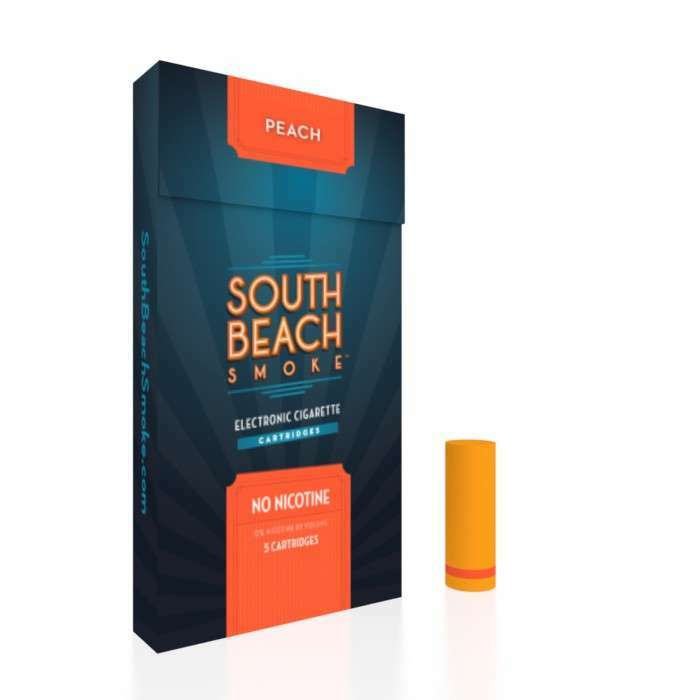 Depending on which starter kit you purchase, your South Beach Smoke electronic cigarette will include up to 20 prefilled, vaporizer cartridge refills in the flavor and nicotine strength of your choice. Why Choose South Beach Smoke? For a realistic smoking experience without the smoke, there is no substitute for our deliciously-flavored liquid-filled cartridges. Customers rave about the solid quality and durability of our simple two-part vape system that’s easy to use and virtually mess free. And our refill flavors are rich and satisfying to even the pickiest of vapers. As if the quality of our products isn’t enough, our focus on the satisfaction of our customers is the rival of the vaping industry. To thank our loyal customers for their support, we offer a home delivery program that includes order discounts, automatic delivery of replacement cartridges and a lifetime warranty on all parts and equipment. And once you’ve placed your first order with us, you’re automatically enrolled in our exciting rewards program! Rewards members receive points redeemable for discounts on future purchases for every dollar they spend with us, every birthday they celebrate and every review they leave on our site. Finally, South Beach Smoke carries larger devices (aka e-hookas or vapes) that are very durable and chuck large clouds of vapor. We can easily outfit customers looking to take their vape experience to the next level with a customized MOD, tank or coil. And those who enjoy a different kind of vape will love our large selection of dry herb vaporizers. Customers who start their experience with South Beach Smoke cartridges tend to return to us for years for all of their vaping needs. Your choice of South Beach Smoke e-juice cartridges will differ according to your reasons for vaping and your individual tastes. Those looking for an alternative to smoking “analog cigarettes” have a variety of flavors to choose from. Deluxe Tobacco Classic cartridges may be preferred by those who are trying to duplicate the taste of full-flavor tobacco such as a Bold American Red. Those who are trying to replace cigarettes might prefer Deluxe Tobacco Blue cartridges. Golden Tobacco flavor is available for those who smoked robust Turkish cigarettes and, of course, we carry Deluxe Menthol for a realistic menthol experience. You may select our cartridges in nicotine levels ranging from 6-24 mg depending on the intensity of your needs. As time goes on and you’re ready to wean your body off its dependence on nicotine, you can slowly reduce the nic level over time without losing the flavor, mouth feel, throat hit or physical sensation of smoking. Customers want to leave smoking behind don’t have to suffer through the bitter taste of tobacco! We offer fruity flavors for a refreshing, relaxing vape reminiscent of smoking a hookah. Chocolate or vanilla flavors are also available for those who desire a more luxurious vape with their morning coffee or after a satisfying meal. Finally, if you’re unsure what flavor you’ll prefer try our new Flavor Bundle to sample our most popular flavors. Making your first vape cartridge purchase doesn’t have to be overwhelming! South Beach Smoke is available to answer all of your questions and assist you in choosing the vape pen cartridge that’s perfect for you. Text, call or email us anytime, and let our elite customer service team help you choose the best electronic cigarette cartridges for your needs.